9. Order - the Customer's declaration of intent aimed directly at the conclusion of the Sales Agreement specifying, in particular, the type and number of Goods. 2.2. These Regulations are the terms referred to in Article 8 of the Act on provision of electronic services. 2.3. The online shop operating at www.myKotty.pl is run by myKotty sp. z o.o. (conducting business activity in Poznań, 60-855, ul. Petera Mansfelda 4, Tax Identification Number: 781-197-79-85, REGON: 380934797, registered in the National Court Register under the KRS number: 0000743289 date of register 19-12-2018.
d.) rules of concluding sales agreements with the use of the services provided in the Online Shop. 2.6. To use the online shop the customer should have access to a computer or an end-device with Internet access. 2.7. In accordance with applicable laws myKotty sp. z o.o. reserves the right to limit the provision of services via the Online Store to people who are 18 years of age or older. Potential customers shall be notified of the above. 2.8. Customers can get access to these Regulations at any time via a link found on the main site www.myKotty.pl, and download it to make a print. 2.9. Information about the Goods given in the online shop, and in particular their descriptions, technical and performance characteristics, and prices, are an invitation to conclude an agreement within the meaning of Article 71 of the Civil Code. 3.1. To use the Online Shop the customer must register on the website. 3.2. Registration takes place by completing and accepting the registration form available on one page of the Shop. 3.3. A condition of the registration is to agree to the content of the Regulations and to provide personal information marked as mandatory. c.) commits other behaviours that are considered by myKotty sp. z o.o. inconsistent with applicable law or general principles of using the Internet or detrimental to the good name of myKotty sp z o.o. 3.5. A person who has been deprived of the right to use the Online Shop cannot register again without prior consent of myKotty sp. z o.o. 3.6. To ensure safety of transmission of messages and data as part of the services provided within the Site the online shop takes technical and organizational measures appropriate to the seriousness of safety of services, in particular, measures to prevent acquisition and modification of personal data transmitted over the Internet by unauthorized people. e.) use any content contained in the online shop only for personal use. f.) use the online shop in accordance with the rules in force in the Republic of Poland, the provisions of the Regulations, as well as the general principles of use of the Internet. 1.myKotty sp z o.o. may process personal data in order to fulfill the order based on art. 6 par. 1 lit. b GDPR and obtains this data from customers. 2. The transfer of these data is voluntary, but necessary to complete the order. Because without this data, there will be no contract - sale purchase. 4. Personal data will be stored for an indefinite period of time, minimum 5 years due to tax law, as well as due to the rebate policy, and the organization of special offers. 5. The customer has the right to request access to his personal data, rectification, deletion or limitation of processing, as well as the right to object to the processing and the right to transfer data. 6. The customer has the right to lodge a complaint to the supervisory authority, which is the President of the Office for Personal Data Protection. 7. The data administrator undertakes to observe the confidentiality related to the client's data and not to disclose this data to unauthorized persons and to properly secure this information against access of all unauthorized persons. The store does not use this data for purposes other than those specified in the Regulations. 8. In matters not covered by these regulations, the provisions of the Civil Code and relevant laws of Poland, as well as European Union law, in particular the GDPR, shall apply. 4.1. Information about the Goods given in the online shop, and in particular their descriptions, technical and performance characteristics, and prices, are an invitation to conclude an agreement within the meaning of Article 71 of the Civil Code. To conclude the Sales Agreement through the online shop the customer must go to the website www.myKotty.pl, choose the goods and their quantity, take technical steps based on the displayed messages and information available on the site. 4.2. The customer selects the Goods ordered by adding them to the shopping cart. 4.3. When placing the Order - until pressing the "Order" button - the customer can modify the input data and the selected Goods. To do so, the customer must follow the messages and information available on the site. 4.5. To send the Order it is necessary to accept the Regulations, provide personal information marked as mandatory, and press the "Place Order" button. 4.6. When the Customer places the Order it signs a declaration of its intention to conclude the Sales Agreement with myKotty sp. z o.o. Sale in accordance with the Regulations. 4.7. After placing the Order, the customer receives an e-mail entitled "myKotty.pl - confirmation of receipt of the order" that contains the final confirmation of all essential elements of the Order. 4.8. The Agreement shall be considered concluded from the moment of the customer's receipt of the e-mail referred to above. 4.9. The sales agreement is concluded in Polish, and its content complies with the Regulations. 4.10. Customers can get access to these Regulations at any time via a link found on the main site www.myKotty.pl, and download it to make a print. 4.11. Consolidation, protection, and sharing of data on orders, General Conditions (Regulations of the online shop) takes place via e-mail. 5.1. The Goods are sent to the address indicated by the customer when placing the Order. 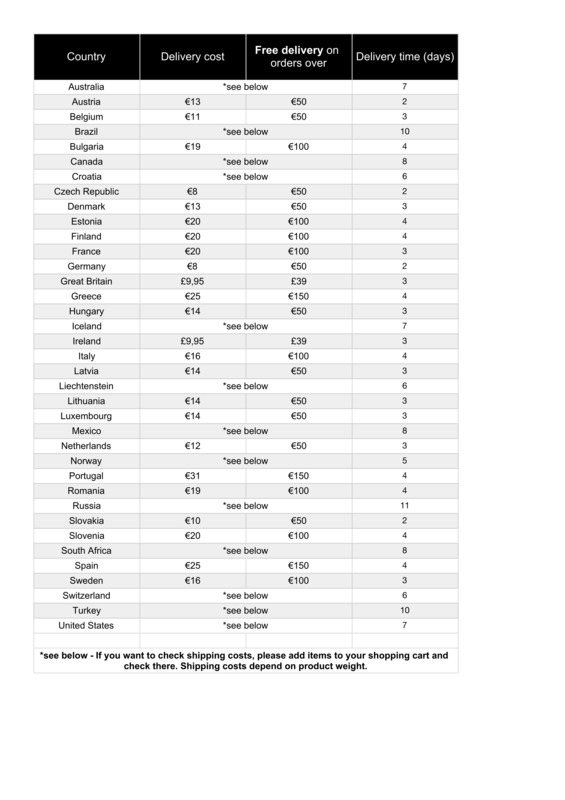 For shipping to countries outside the List below please contact us mykotty@mykotty.pl to determine the delivery cost. 6.1. Prices for the Goods are given in British pounds and include all components, including VAT (with the rate height), customs and any other components. 7.1. Only the customer who is also a consumer shall be entitled to a 100-day deadline for withdrawal. 7.2. The consumer shall have the right to withdraw from this agreement within 100 days without stating any reason. The deadline to withdraw from the agreement shall expire after 100 days from the date on which the customer comes into possession of things or a third party other than the courier company and a person indicated by the customer comes into possession of things. 7.3. To exercise the right of withdrawal the customer must inform us by post at myKotty sp. z o.o., Poznań, 60-855, ul. Petera Mansfelda 4, or via e-mail mykotty@mykotty.pl about its decision to withdraw from this agreement by an unequivocal statement (e.g. a letter sent by post or via e-mail). 7.4. The customer can use the model withdrawal form which was sent in an e-mail with the confirmation of your purchase but it is not mandatory. 8.1. As a seller, myKotty sp. z o.o. is liable to the customer who is a consumer within the meaning of Article 22  of the Civil Code under the warranty for defects to the extent specified in the Civil Code, in particular, Article 556 and Article 556  - 556  and the following articles of the Civil Code. 8.2. Complaints under infringement of rights guaranteed by law or under these Regulations should be addressed to mykotty@mykotty.pl; myKotty sp. z o.o. shall investigate each complaint within 14 days. If a complaint is not investigated within the specified period it means it is recognized as justified. 9.1. myKotty sp. z o.o. shall undertake actions to ensure correct operation of the shop to the extent that results from its technical knowledge, and undertakes to remove any irregularities reported by customers within a reasonable time. 9.2. The customer shall be obliged to immediately notify myKotty sp. z o.o. of any irregularities or interruptions in the functioning of the Shop. 9.3. The customer may inform about any irregularities related to the functioning of the Shop in writing to the following address: myKotty sp. z o.o., Poznań, 60-855, ul. Petera Mansfelda 4, POLAND, or via e-mail to the address mykotty@mykotty.pl or using the contact form. 9.4. In the complaint the customer should provide their name, mailing address, nature and date of irregularities related to the functioning of the Shop. 9.5. myKotty sp. z o.o. shall consider each complaint within 14 days. If a complaint is not investigated within the specified period it means it is recognized as justified. 10.2. If the consumer is not interested in the possibility to use extrajudicial methods of settling disputes, any disputes arising between myKotty sp. z o.o. and the consumer shall be taken to courts competent in accordance with the relevant provisions of the Code of Civil Procedure. 10.3. Any disputes arising between myKotty sp. z o.o. and the customer, who is not a consumer, shall be taken to a court competent for the seat of myKotty sp. z o.o. 10.4. To all matters not regulated herein the regulations of the Civil Code, the provisions of the Act on electronic services, and other relevant provisions of the Polish law shall apply. The online shop ("Service") operating at www.myKotty.pl is run by myKotty sp. z o.o. (conducting business activity in Poznań, 60-855, ul. Petera Mansfelda 4, Tax Identification Number: 781-197-79-85, REGON: 380934797, registered in the National Court Register under the KRS number: 0000743289 date of register 19-12-2018, ("Administrator"). Please read these terms and conditions before using the Service. By using the Service you acknowledge acceptance of these terms regardless of whether or not you choose to register in the Administrator's Service. , which provides electronic services, stores, and accesses information in user devices. 3. The user can limit or disable the access of cookies to its Device. If the user selects this option the use of the Service is possible, however some functions which require cookies by their nature will not be available.